Healthy Thai Pumpkin Soup made with Thai Red Curry Paste and Coconut Milk.A perfect whole 30 approved,Paleo,Gluten Free Dinner!If there was one soup that I had to choose over all others -THIS WOULD BE IT! Okay confession.I am not a soup person. I think I say this in every soup recipe I have posted on the blog.But that’s just it.I am not a soup person.Despite that, I make a lot of soups.First cause hubby loves them and how! and second, because they are healthy and super filling.In fact, they are an ideal weeknight dinner. 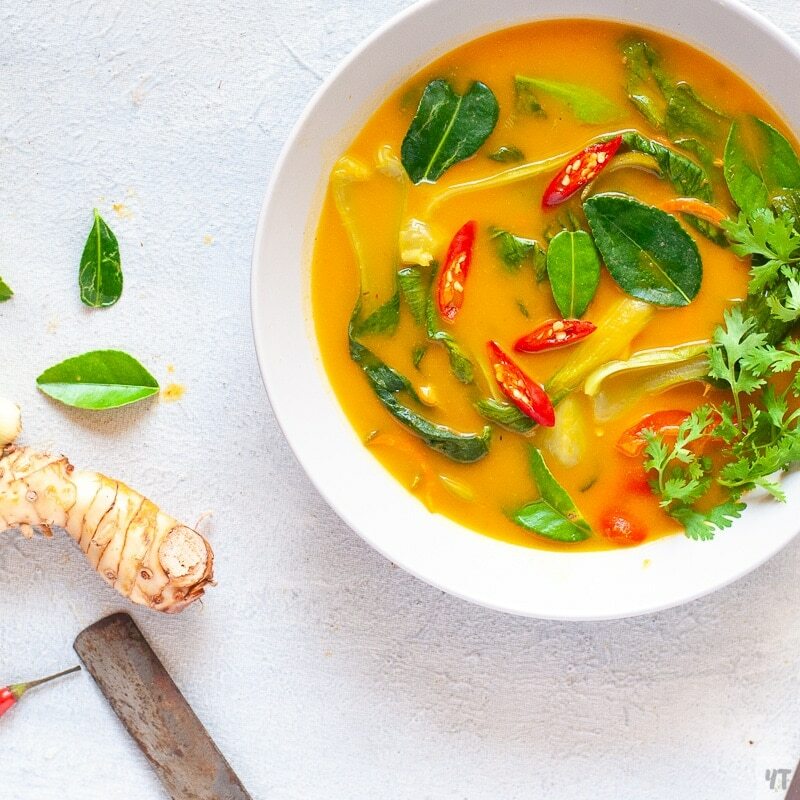 This Healthy Thai Pumpkin Soup though doubles up as a soup AND a curry! Slightly thick version of it can be passed off as Thai Curry(albeit very non traditional but so so yummy!) and the thin version can be served as a Soup. This version of Healthy Thai Pumpkin Soup probably doesn’t exist in Thailand but in my house its a favourite!It’s so so comforting without being sad and bland! The pre requisite to the soup is Red thai curry paste.You could use store bought paste or make it on your own.I like to make my own.You can check my recipe of red thai curry paste here. This soup is approved by all diets and dieters around the world.Check the nutritional label below the get the exact details. Cancel the “PRESSURE COOK” setting.Select the “SAUTE” setting.Add oil to the pot. Once the oil is hot, add the red thai curry paste. Saute till fragrant- about 2 minutes. Season with salt and Add more water to adjust the thickness of the soup. Heat a deep pot, add oil. To this, add the red thai curry paste. Here are some bonus healthy recipes for you!